The developments could potentially make it feasible to have a 5km span as part of a crossing over the Strait of Gibraltar, says the paper, published in the Proceedings of the Royal Society. The new bridge forms have been identified by a team of researchers from the University of Sheffield and Brunel University London, working with Ian Firth of consultant Cowi. 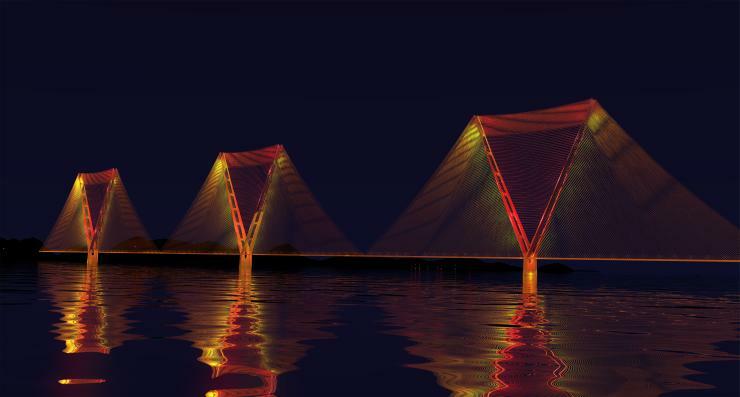 Their approach uses a new mathematical modelling technique to identify optimal forms for bridges with very long spans. The mathematically optimal designs contain regions that resemble a bicycle wheel, with multiple ‘spokes’ in place of a single tower. But these would be very difficult to build in practice at large scale. The team therefore replaced these with split towers comprising just two or three ‘spokes’ as a compromise that retains most of the benefit of the optimal designs, while being a little easier to construct.